Families, huh? You can’t live with them, and you can’t shoot them with a bazooka and then dispose of their remains afterwards. Well, that is unless you watch this 108 minute movie made in 2000. It was Directed by Jay Roach; and Starred: Robert De Niro, Ben Stiller, with Owen Wilson. Let's face it Pam (Teri Polo), he doesn't like me very much, does he? Your father I mean. 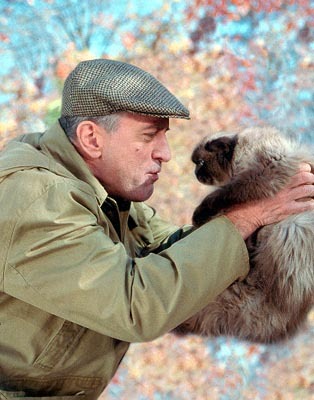 Your father Jack (Robert De Niro). I know he doesn't like me because he sees me as some sort of clumsy cat-hating Jewish-nurse, who smashed his mothers urn by accident. But come off it, princess! I can't help who I am, can I? I love you. You love me. And I promise I will do everything in my power to get Jack to like me too, just so I can ask him to give me your hand in... errr... hmm... ops! Almost let the cat out of the bag there, didn't I? No, Pam! No-No-No! I'm not hiding anything from you, my love kitten. Honestly, I'm not. Not your brother Danny's (Jon Abrahams) secret drug habit. Or how I accidentally killed your Dad's cat and then tried replaced him with a new one, round about the same time I messed up your sisters wedding plans by mistake! Ah-huh! Yeah! That's right. I said wedding. Cause.. well... I've been meaning to ask you this for quite some time now, but I was wondering if that's why what next transpires all kicks off when you say to me, 'Greg Focker, I'd like you to meet my stinking-rich ex-boyfriend, Kevin (Owen Wilson)'. As a CIA Daddy steps up his game - a family gathering takes a refrain - this film doesn't star Orson Welles - and at the end of the day, can you hear wedding bells? 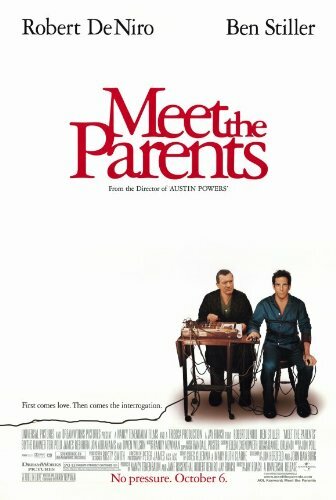 The way I see it, folks, ‘Meet The Parents’ is a family friendly comedy that only works because of the two main actors who star in it. 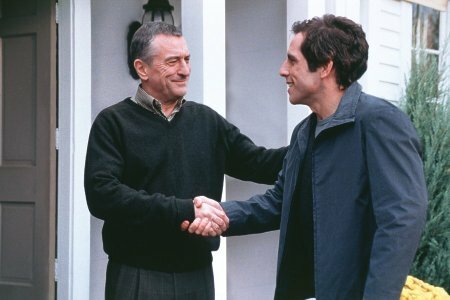 Ben Stiller and Robert De Niro. Well, you have to understand that De Niro is venturing into Stiller’s territory here, and he really does try to pull out all the stops so he can ‘fit in’ -- so to speak. Tonally De Niro does this by not ‘over-acting’, but rather ‘under-acting’. Thus allowing the awkward moment’s in-between dialogue to act as ‘the humor’. Where as Ben complements this style by channeling an ‘old-school’ technique of ‘reacting’ instead of ‘acting’. And this, in turn, makes the whole experience seem more playful somehow. Less showy even. Now something else I found rather ''old school' about this flick was how the overall narrative was structured. Firstly, all the 'unfortunate instances' that occurred seem to envelop one after the other after the other -- which can come across as being a bit monotonous in places, ‘one key’ in tone, plus formulaic by default. And secondly, to make matters even more strained on these proceedings, certain members of the cast do appear to be used as devices to give exposition to – like the Blythe Danner character for instance. Or alternatively, felt like cogs to drive the general plot-line along in the right direction – like Owen Wilson or Jon Abrahams characters. However, this ‘downhill slide’ is par of the course for a film such as this one, because you know that by the very end it the ‘pay off’ will be all the more sweater. Well, what else would you expect from a jovial rom-com, eh? War and Peace? Nah. At best, this is a movie that does exactly what it sets out to accomplish -- entertain, spread a bit of personality, and try to make you forget the state of play in the Middle East for the next hour and forty. Oh! Wait a minute. That just reminded me of something. Something to do with the following filmic-facts. (1) 'Universal' first released this $55 million dollar production on the 6th of October, 2000, and eventually made back $330.4 million dollars at the box office. (2) Loosely translated, this project was entitled 'The Family of My Girlfriend' in Argentina; 'My Bride, Her Father And I' in Austria; and the 'In-Laws' in French-Canada. (3) There were three taglines used to promote this picture. The first one was, 'First comes love. Then comes the interrogation'. The second one was simply, 'No pressure'. Where as the third tagline was, 'He finally met the girl of his dreams. Too bad her dad's a nightmare'. (4) The majority of this movie was shot on location throughout the two American states of New York and Illinois. In Illinois you might notice Chicago and Winnetka. Whilst in New York you might notice Brooklyn, Pound Ridge, Vinegar Hill, Harrison, Westchester County Airport, plus Greenvale, Old Brookville, Oyster Bay, and Port Washington, situated in Long Island. (5) This family comedy is actually a remake of a 1992 film of the same name directed by Greg Glienna, and produced by Jim Vincent. (6) During one point in its development this flick was going to star Jim Carrey as Greg and Christopher Walken or Anthony Hopkins as Jack. As a matter of fact, Jim also contributed some of the jokes to the final script. (7) The 'Motion Picture Academy Of America' wouldn't allow the makers of this movie to use of the name 'Focker' unless they could find a person with that specific surname. Of course, they did just that. (8) According to De Niro, the car chase sequence seen in this adventure was meant to be a spoof of his 1998 action-adventure, 'Ronin'. 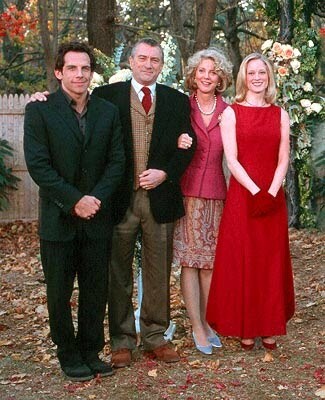 Overall I'd say ‘Meet the Parents’ is a fairly nice film to sit down and watch. Its funny in places. Its stilted in others. And in it's own way its somewhat reminiscent of some of Ben’s other films, such as ‘Along Came Polly’, or ‘There is Something About Mary’ -- which is a good thing I suppose. Don't you agree, alternate youtube clip?